Four turboprop engines with spinning propellers, sonar buoy launch tubes, sensor boom, reinforced wing walkways, wing pylons, landing gear and main entry door. Fuselage includes rescue hatches, observation windows and removable cockpit/fuselage roof sections for access to the interior of the model. Cockpit flight controls and seating for the pilot, co-pilot and flight engineer. The aft portion of the aircraft feature the Tactical Coordinator, Navigator/Communicator, two Acoustic Sensor Operators (SS1/SS2), Electronic Warfare Operator, IFT (In Flight Technician) and ORD (Ordnanceman) stations, as well as, the interior sonar buoy launch tubes, buoy storage rack, kitchen/galley area, and left & right rear observation window seating. Printed step by step building instructions with U.S. insignia decals and squadron markings of Navy Patrol Squadron Forty "Fighting Marlins." Includes Pilot, Co-Pilot, and Flight Engineer minifigures. 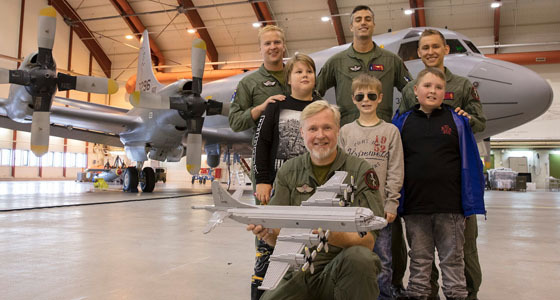 We were asked by the wife of a P-3 Orion Pilot to create a custom LEGO version of the plane her husband, Andy, flies for the U.S. Navy. The kit was a surprise gift for Andy and their son, who are both big LEGO fans. They received the completed kit in time to build the model together, prior to Andy deploying to Afghanistan as part of Operation Enduring Freedom. "The resemblance to the real P-3 is amazing! My son and I enjoyed building it. Thanks for designing this kit." A Royal Norwegian Air Force version of our P-3 Orion Kit, created for the RNoAF Squadron 333 "Saints" at Andøya Air Station, Norway.